European skull cleaning is done with Beetles. No longer accepting Swans, Geese, or Turkeys. Sorry for the inconvenience. Please email or call for further exotic pricing, we'd love to assist you. Extra charges will be added for custom bases, habitat, panels, form alterations, & providing capes. Extra charge on open mouth mammal mounts: $95.00 (deer), $225.00 (elk), $225.00 (Mtn lions). Extra charge for skinnng at the rate of $50/hour. Rug prices are per linear foot as measured by us. Linear foot is measured from Nose to Tail. 20% deposit required at drop off or before mammal is worked on payments are negotiabe. 50% deposit before fish is started. 20% payment is due at time of drop off on birds. Fish are single sided. Double sided pedestals available for extra charge. Shoulder mount skin diagram. 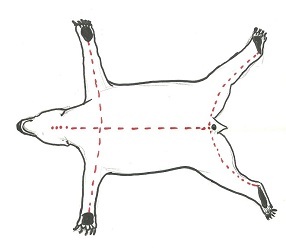 Bear Rug skin diagram.